13/9/08 — Art Market — Paris — The Biennale des Antiquaires is traditionally dominated by Decorative Arts. Just after entering, visitors will notice the Galerie Vallois stand, specialized in 30’s furniture, with several pieces remarkably enhanced in an understated décor, and the Galerie Chevalier which can only exhibit, due to their large size, a few tapestries, as always of impeccable quality. 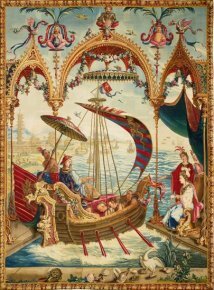 We reproduce here (ill. 1) one part of the series of the Story of the Emperor of China produced in Beauvais at the end of the 18th century with cartoons by Guy Vernansal, Jean-Baptiste Monnoyer and Jean-Baptiste Blin de Fontenay. There are fewer old master paintings than in the past, as several dealers, both French and foreign, have chosen not to come. Thus, 17th century French works are particularly rare, except for the Jacques Leegenhoeck stand presenting two canvases which were already shown recently but of very high quality : a Solomon’s Judgement by Laurent de la Hyre and a Charles Dauphin, a painter from Nancy and student of Vouet’s, previously displayed at the Didier Aaron Gallery (ill. 2). A youthful La Hyre (Saint Mary Magdalene) is also presented at the Galerie Ratton-Ladrière. 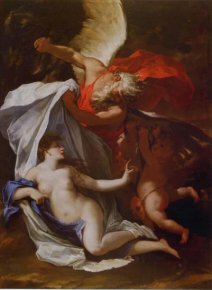 One of the most important old masters is undoubtedly an early Poussin, recently shown in New York by Pierre Rosenberg in the exhibition Poussin and Nature at the Metropolitan Museum (see article). It is offered by the Adam Williams Fine Art Ltd. Gallery. 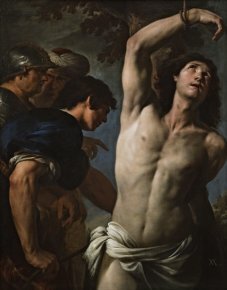 There is a bit more Italian painting on display, notably at the Canesso Gallery, a specialist, where visitors can see a magnificent Saint Sebastian by the Neapolitan artist Andrea Vaccaro (ill. 4). Another stand with a rich offering of old master paintings is Robilant + Voena, which should not be missed. 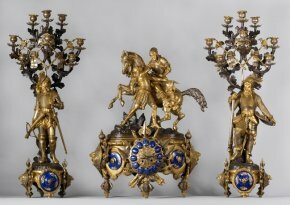 At the Colnaghi stand, many of the works had already been presented at the last Maastricht Fair,notably the spectacular The Tarantella by Jacques Sablet, a national treasure which the Musée Fesch seems to have trouble acquiring through patronage efforts (see news item of 18/11/07) and which may end up in another collection. 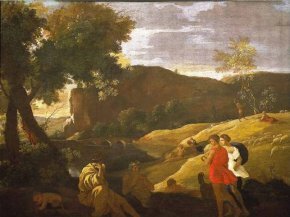 The Didier Aaron Gallery is showing two grisailles by Donato Creti as well as a remarkable, very accomplished drawing by Alexandre-Evariste Fragonard representing Homer and the Shepherds (ill. 5) which has a pair at the Louvre. Both were engraved by Mathieu Baratier in 1827. At the Galerie de Bayser, specialized in old master drawings, there are nevertheless some paintings including a large canvas by Henri Regnault depicting Judith and Holophernes. The 19th century is particularly well represented with several sheets by Géricault and Delacroix. 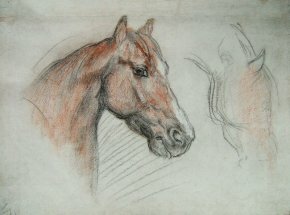 We reproduce here a beautiful study of horse heads by Théodore Chassériau (ill. 6). With the exception of the bronzes at the Galerie L’Univers du Bronze, the only sculpture specialist here this year, given Daniel Katz’s absence, is Patrice Bellanger. 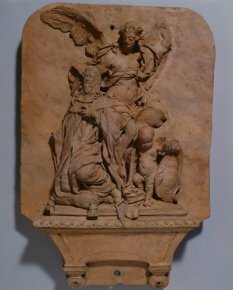 At his stand, visitors can enjoy an impressive plaster (ill. 7) by Jean-Baptiste De Bay (known as De Bay father). 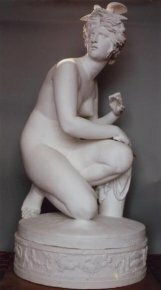 This large sculpture, with a patina and smooth aspect resembling marble, was conceived as a lone work. 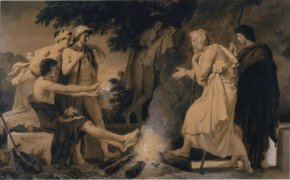 There is a group of Three Fates in Angers which uses the same figure ; one of the two other divinities is by the artist’s son, Auguste-Hyacinthe De Bay, whom we talked about recently when the Louvre purchased one of his works (see news item of 16/3/08). At the Emmanuel Moatti stand, next to the old master paintings, there are several terra-cottas including a model for a funerary monument attributed to the Dijon sculptor Jean Dubois (ill. 8). We conclude our very short review with a gilt bronze group (ill. 9) by Carlo Marochetti executed in collaboration with Louis-Marie Moris, close to the spirit of works by Théodore Gechter or Antoine-Louis Barye, presented by the Galerie Chadelaud.